Weight gain and weight loss, loss of the skin’s normal elasticity with age and pregnancy and previous surgery can all lead to bulging and excess skin and fat in the abdomen as well as abdominal wall weakness. This excess tissue can be removed using liposuction or surgery or a combination of both. Sometimes the muscles of the abdominal wall need to be tightened or even hernias repaired. involves assessing the extent of the problem. The quality of the tissues is examined looking at the elasticity of the skin as well as the deposits of fat. A careful check is made for the presence of hernia and abdominal wall weakness. The requirements of your surgery will be discussed. A moderate prominence of the tummy combined with good quality skin makes liposuction a good option. Once the skin of the abdomen has been overstretched (stretch marks prominent) then surgical excision of tissue is usually required. 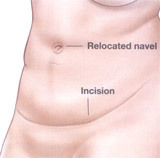 Small to moderate amounts of skin excess may be treated by a “mini abdominoplasty” – in this procedure the tummy button (umbilicus) is not required to be repositioned. In a full tummy tuck (abdominoplasty) then the amount of tissue to be removed requires a long incision (usually from hip to hip) and the skin of the abdomen is shifted down requiring the tummy button to be repositioned. Both the mini and full abdominoplasty may be combined with tightening of the abdominal muscles and liposuction. involves a general anaesthetic. The patient has the deposits of fat and areas of excess skin marked prior to surgery. The excess skin and fat is removed as discussed at the consultation. With a mini- abdominoplasty or full abdominoplasty drainage tubes are placed into the wound and are removed after a few days. recovery of the patient depends on the extent of their surgery. Patients having purely liposuction or mini abdominoplasty may be able to go home the same day. A full tummy tuck takes about 2 hours of operating and requires a stay of 1-2 nights in hospital. Most surgery/liposuction to the abdominal wall requires compression garments to be worn afterwards. Liposuction patients usually have 1 week away from work. 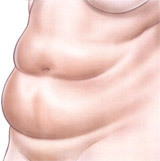 Whereas surgical abdominoplasty require 2-3 weeks. It takes about a week before the patient is walking freely.